The final outcome of this drawing is completely different to what I first had in mind. I was going to keep with the sakura tree in the background and create a light coloured wall with the touch of pink from the sakura. However, as you can see through my progress GIF, it developed into darker colours. I used Eno's character as a reference, changed quite a few things (the head, hands, position of arm holding the umbrella) and added my own designs. I was inspired by Re°'s recent drawings (Check out his/her works on pixiv, one of the few artists I follow). So I worked to combine the many elements together with the character as one (hence the title). A new piece for a new year, Happy New Year! :D haha, a little late, but better than nothing. Browse Eno Gallery: Recent | Popular. 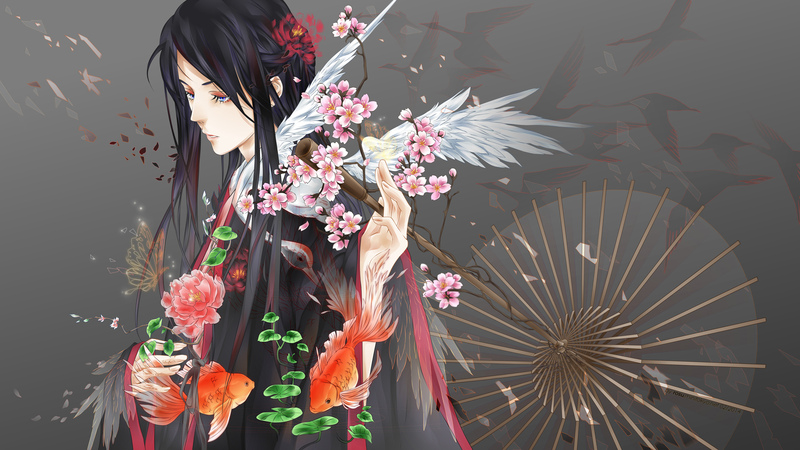 it's a beautiful piece of digital art! I love the colors and their contrast! awesome work! Fragments As One and Forsaken are truly amazing pieces of art (and my favorites) for which I thank you for sharing here. I also love the progressive gif displaying the making of your latest wall. In all, very well presented and awesome art. You have great potential as an upcoming professional artist. Be well and keep up the great work. I personally like the darker image and background as well as the birds that were added...they gave the image depth and more intensity. This is amazing. 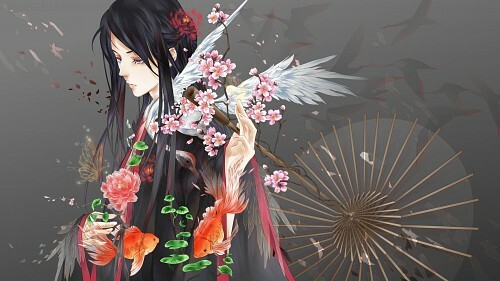 I love how I get the feeling that the koifish and the crane are coming to life from his kimono. Your technique is pretty amazing too, can't stress that enough. I would've liked a version without the birds in the background. I already desk'd it on all my gadgets. This is absolutely lovely. Gorgeous, subtle, tells so many stories at once. This is incredible. Thank you for the .gif showing your work in progress as well, it's interesting to see how it all came through.